The Vanity license plate on my car. I know what I meant…it was an afterthought…honest! That’s right, this is the Vanity license plate on my car. It was not intended, but the end result after years have passed, I am happy with it. This plate has been the source of lots of humor and one single negative instance among my family and friends. The single negative instance involved my second failed marriage and my wife at the time and her flat “her-way-or-the-highway” refusal to allow me to put it on my car. Eventually I took the highway, and so did this license plate. That in itself is a whole ‘nother story. Which may never be told…but putting this plate back on my car last fall is a small representation of me getting my life back together. One other blog site, last January, after I made an announcement that I was in the process of a divorce, made the observation that I was taking time off for “personal realignment.” Getting my life back together, personal realignment, yeah, either definition works. Returning to my mindset of humor, education, and inspiration to post this topic; about ten or so years ago, I submitted to the Pennsylvania Department of Transportation an application for a Vanity Plate. I had to submit three choices, and I naturally wanted a fly fishing theme. The first three I tried were: FISHON, FISHONN, AND WETFLYS. I really wanted FISHON because I holler that a lot when I fish with my friends. But the form came back with all three rejected. They sent me another application so in the second round I picked: TYZFLYZ, TYSFLYS, and for lack of being able to come up with anything else, I impulsively wrote, NYMPHS. As evidenced by the photo above, this is what I got. They say, be careful what you wish for, you may get it. I got NYMPHS even though I didn’t actually wish for it. Then she said it again, only with more emphasis, as in, “NYMPHS! NYMPHS! Why did you get that?” she asked somewhat incredulously. It is important to note that she was smiling. I mumbled and sort of stammered an excuse along the line that I did not get the plate I really wanted; that I picked NYMPHS as an impulsive choice and never thought I would actually end up with it. Lou Anne was never angry or even slightly displeased with this situation. Nymphs – Minor divinities of ancient mythology represented by beautiful maidens residing in forests, fields, mountains, meadows, and waters. 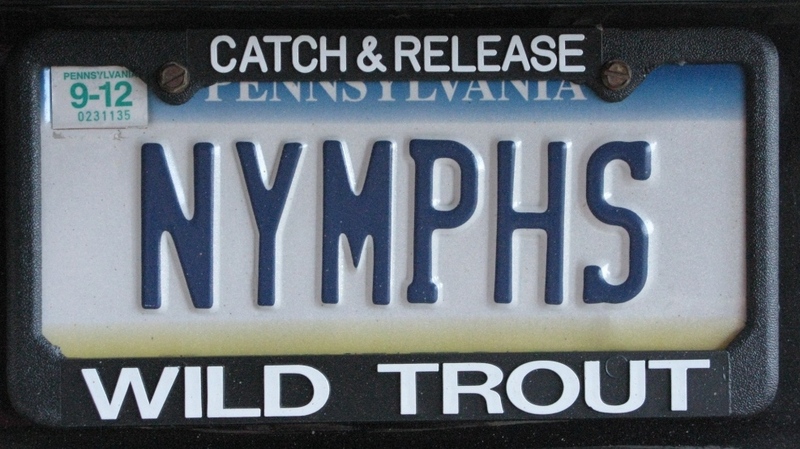 A friend from my local Trout Unlimited Chapter once served as a host for a group of the New York Angler’s Club, one of them drove his New York vehicle with a NYMPHS license plate, but in his case, it was on both front and back of the car. 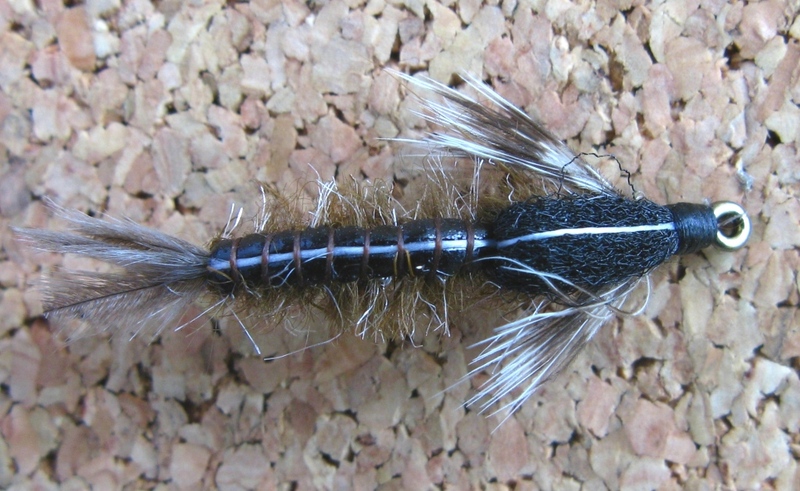 Golden Stonefly Nymph #8, tied by Don Bastian, same fly as above, different angle. Sometimes that is all you have to do to the trout, present your nymph in a slightly different manner…or angle of drift. Isonychia Nymph Size #10, aka, Slate Drake, side profile. Note the realistic side-profile bulge in the wing case…that’s specific tying material application to imitate the real bugs. Isonychia Nymph Size #10, top view. Note the short legs, again, realism designed to match the natural nymphs. This is one of my favorite nymph patterns. I made this post today, but am heading to my cabin very soon for a winter weekend of fly tying and camaraderie with friends. I will follow up next week with pattern recipes, and more information. Oh, and to clarify, I’ll be driving the Nymphmobile. Added Monday, February 13: The weekend at the cabin was great, lots of fun, and while I made a pot of chili, ham & cheese omelets one morning, pancakes and bacon the next, and grilled Rachael and Reuben variations for lunch, one much-appreciated favor was that one of my friends cooked the evening dinners. Since I normally do most of the cooking, I really enjoyed the respite of tying flies until called for dinner. Hook: #8 2x long or 3x long nymph hook; may be be curved or a bent-shank nymph hook. The body is widened by side-lashing sections of .020 wire to the hook shank. 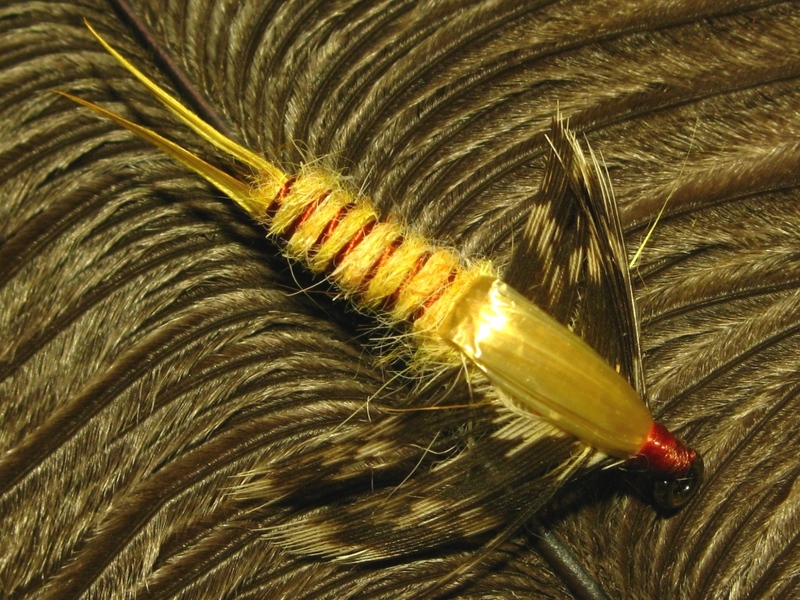 Tail: 2 amber colored goose biots (apply a small amount of dubbing to the hook before attaching the biots to the end of the body. The biots are best attached to the side-lashed wire, not the hook itself; this gives them the realistic separation similar to naturals, as visible in the photo. Abdomen: Rabbit dubbing; this color is custom-blended with amber, yellow, orange, and cream. Wingcase: Pale yellow raffene (synthetic raffia). Legs: One or two mottled brown hen back feather sections tied into thorax area, the dubbing is applied and then the leg feathers are pulled forward so that the barbs spread out to the sides under the wingcase. 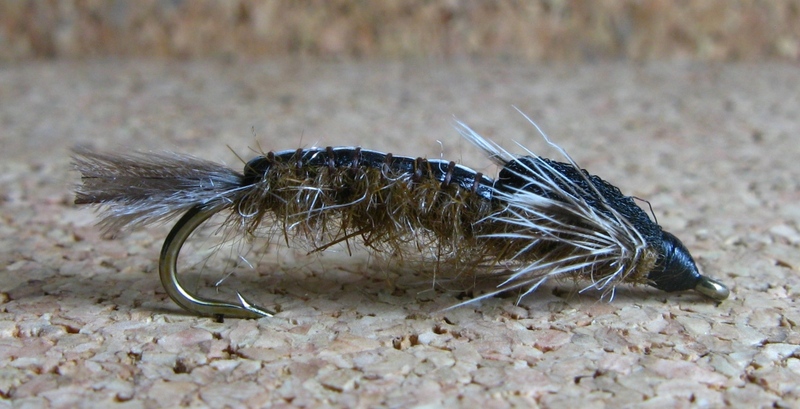 The Golden Stonefly Nymph is a good searching pattern in any waters where stoneflies occur. This is basically the pattern of my friend Dave Rothrock. 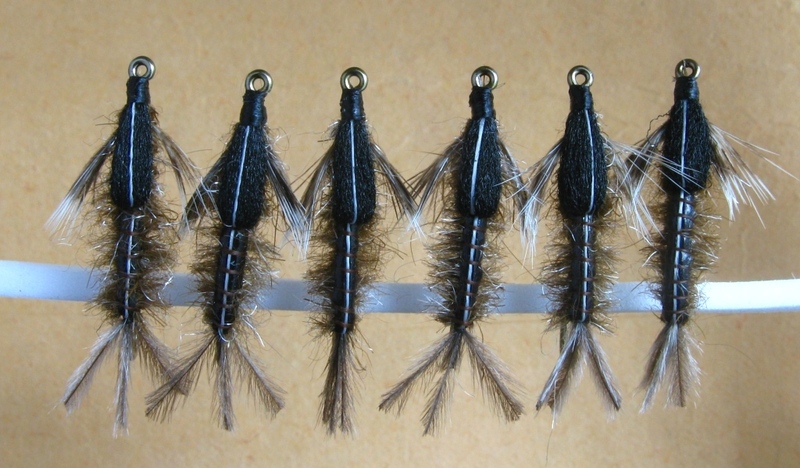 Dave is a meticulous tier, and I tend to tie some patterns with deliberation, but since this nymph is so effective, my commercial tying experience kicked in and I made some changes in the materials to speed up the tying process. Tail: 3 sections of natural ostrich herl, cut along the tips to imitate the comb-like hairs of the naturals. Rib: A single strand of Danville brown rayon floss, tightly twisted, 6 – 7 wraps. Over-back Stripe: Danville white 3/0 Monocord, or 2 strands of 6/0, twisted. Abdomen: Dark Brown Haretron dubbing, picked out along the sides. 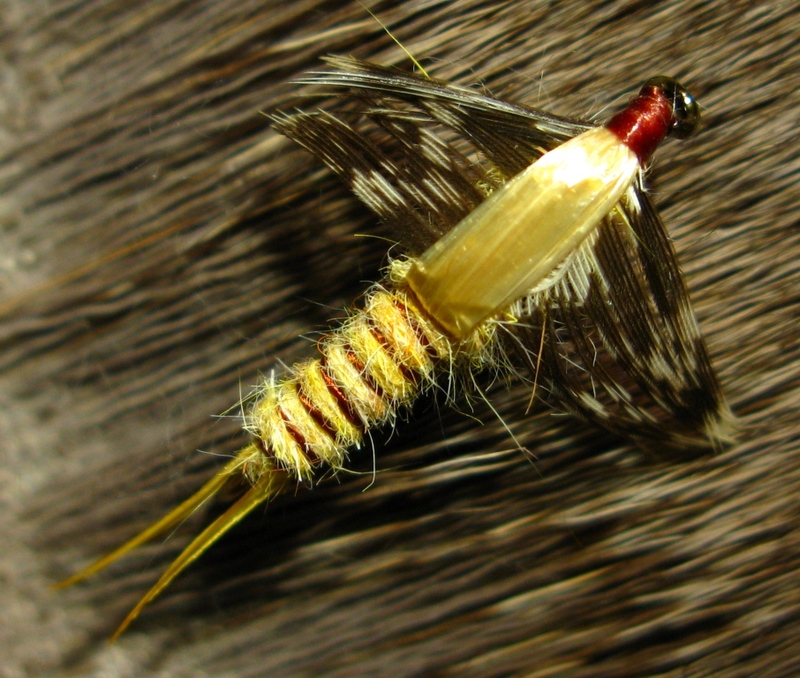 This is a swimming nymph, and I never fish it on tippet lighter than 4x. It is one of my favorite nymph patterns because of the fact the isonychia emerges in both summer and fall. The dates to fish this nymph are from Memorial Day weekend until mid-July, and from mid-September through October. The poly wingcase was one of Dave’s ideas, the bulging side profile it creates because of the bulk in the material is highly imitative of the naturals.